Jobsoid is connected directly with LinkedIn job listings. Any job posting made through Jobsoid can be automatically shown on the Jobs section of your LinkedIn company page. To ensure that your jobs get listed on the right LinkedIn company page, you need to set your LinkedIn Company ID in Jobsoid. View your company LinkedIn page as Admin. Type your company name in the search box and visit the page. By default, you will be presented with admin view. 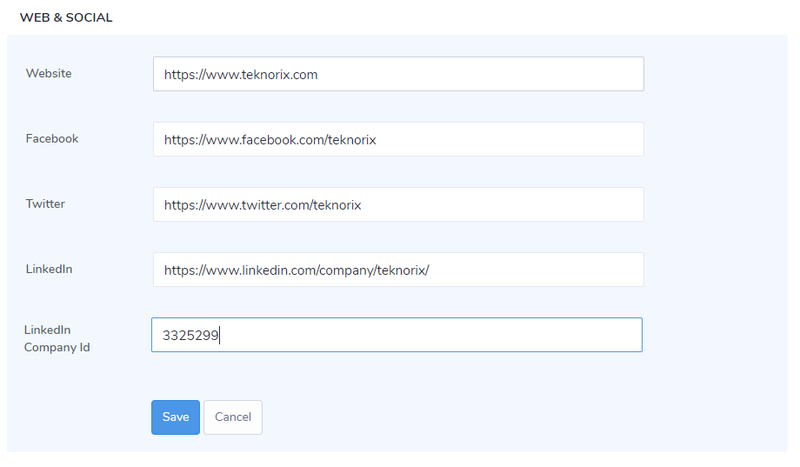 To find your LinkedIn Company ID, you need to first open your company's LinkedIn page in a browser. Now, click on See Jobs button. If you are not able to view the 'See Jobs' button, go to the Jobs tab on your page and click on See all jobs. This will take you to your Jobs page where all your active job openings will be listed. You need to look at the URL of the page now. The seven-digit number between 'f-C=' and '&locationId' is your LinkedIn Company ID. This is your Company ID. Click on the Settings button on the Dashboard and go to the Preferences section. Now, click on Manage Account.